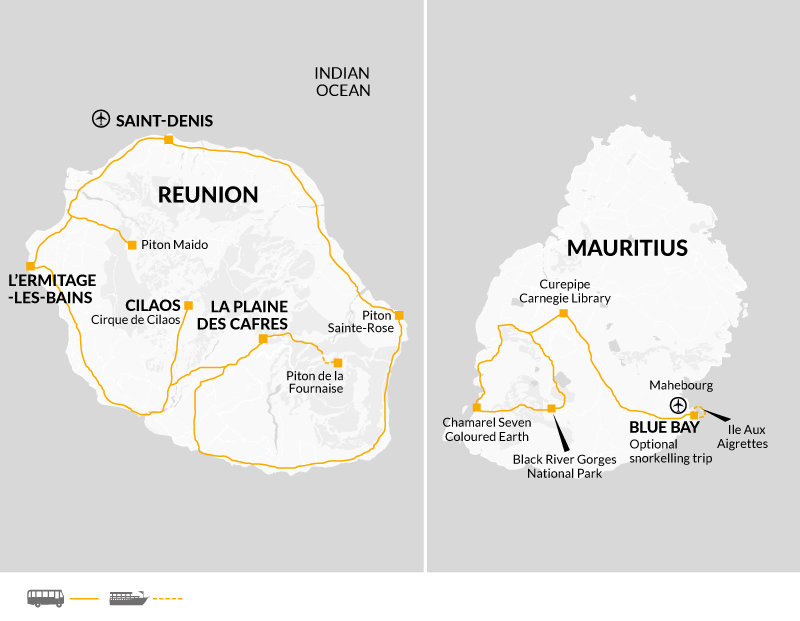 We discover a tale of two islands on this contrasting exploration of Reunion and Mauritius. Volcanic vistas, green fertile calderas and Parisian style boulevards are the highlights of rugged Reunion; whilst we uncover a side of Mauritius rarely seen by most travellers. We find an island rich in culture from its colonial past and geographical importance with beaches and marine life to rival the best in the world. There will be opportunity to try creole cuisine; a true clash of cultures, explore Mauritian bazaars and learn about precious endemic species. The trip begins today in Saint-Denis, the capital of the volcanic island of Reunion. A short briefing will take place this evening before finding a spot in the town for dinner. We start today with a visit to a family owned vanilla plantation to learn about how the spice is grown on the island. We then move on to 'Anse des Cascades', a small harbor, beautifully surrounded by cliffs and waterfalls, where we will take a short, leisurely walk down to the water's edge. We then continue on to Piton Sainte Rose, a town that was engulfed by lava in 1977, though the local church was miraculously spared, leading the locals to believe in divine intervention. We will visit the church, before continuing along the coastal road to see the spectacular lunar landscapes of the south east coast where the evidence of numerous eruptions can be seen in the form of old lava flows down the mountainside. We will stop here for a photo opportunity with time to admire the black and silver tinted volcanic rock and see where the magma has previously encroached on the coastal highway before flowing into the ocean below. Lunch is served in a local restaurant in Saint Phillipe, where we will find delicious Creole curry, often served with rice mixed with locally grown lentils or beans as well as the chance to try the many flavours of Reunionnias rum. Reunion is a part of France, so they are very proud of their gastronomic culture and we will expect to eat well during our time on the island. This afternoon, we visit a spice plantation, for a guided tour to learn more about the spices, vegetables and plants that can be found on the island. Our final stop today will be at palm fringed Grand Anse Bay. Be sure to keep a watchful eye out as it can be possible to spot whales from the shore and many colourful birds in the tree tops. This evening we will make out way inland up to La Plaines des Cafres to our hotel, where dinner will be included. We are up early today to explore the mighty 'Piton de la Fournaise', the active volcano that spared the church we visited yesterday. We will stop at numerous viewpoints such as Nez de Boeuf (Ox's nose), Plaine des Sables (sand plains) with its lunar landscape and Pas de Bellecombe which offers a fantastic view of the first crater. At Pas de Bellecombe, we will have free time in which we can walk around the well-marked paths or learn more about the volcano in the small visitor center. After our short stop, we will continue on to La Maison du Volcan, a modern, interactive museum in which we will learn all we need to know about volcanoes through films, touch-screen quizzes, models and literature. After lunch in a nearby restaurant, we take a scenic road to the UNESCO listed Cirque de Cilaos. The approach to the caldera has many twists and turns until we start driving past fields filled with colourful flowers, green filled forests and huge waterfalls. On arrival, we will have an orientation drive around the town. The word Cilaos derives from the Malagasy word meaning 'the place you do not leave'. Today will be a chance to relax and go at your own pace. We will begin the day with an hour's long, easy walk in the dense forest which surrounds the historic spa town, before we return to the town's main street for a brief visit to the 100 year old embroidery house where ladies of the local community are working hard to keep tradition alive. Lunch is included and the rest of the afternoon will then be at leisure to explore the markets, French bakeries or perhaps take another walk in this stunning caldera. Leaving Ciloas after breakfast we make our way to the National Botanical Conservatory. This conservation area is a 7 hectare park surrounding an old colonial house, created to protect native plants and other species from around the world. Our Explore Leader will guide us around the gardens providing details on different fruits, trees, cactuses, palm trees and birds that are on view. We will also have a chance to walk through the elegant, colonial house before making our way to L'Ermitage-Les-Bains our destination for this evening. We will have a very early start this morning in order to avoid the crowds at Maido Peak, a volcanic peak 2200 metres above sea level. The viewpoint on the rim of Cirque De Mafate looks over the wildest and most inhospitable caldera on the island. Mafate town located in the interior of this caldera is only accessible by helicopter or on foot and during our visit we may see helicopters delivery daily necessities down into the community. The Cirque is completely surrounded by craggy peaks, making it easy to forget one is standing on a small island in the middle of the Indian Ocean. On the way back down we will stop at a tiny, family run geranium distillery to see how some locals still pride themselves in distilling the traditional way. We will have a lunch stop in St Denis, before we make our way to the airport for our flight to Mauritius. Upon arrival we transfer to our home for the next three nights, a charming guesthouse in Pointe d'Esny. The guesthouse's is situated in a quiet location from which you can easily enjoy the warm waters of the lagoon found just down the steps from the guesthouse gardens or take a short 10 minute walk to Blue Bay public beach to see how the local Mauritians gather for large family picnics down by the water. Blue Bay is aptly named for its turquoise waters and makes a perfect spot to enjoy an ice cream or a drink of fresh coconut water whilst taking in the friendly atmosphere. Also as all beaches on the island are open to the public, there is opportunity to walk for an hour or two along white sandy beaches and paddle in the sea. This morning we take a short boat ride over to Ile aux Aigrettes, a small island 800m off the coast of Mauritius that has been designated a nature reserve. Once on the island one of the expert park rangers will take us on a two hour walking tour and introduce us to the unique flora and fauna of Ile Aux Aigrettes. The tour focuses on the fantastic wildlife conservation work that happens here, including the many rare species of bird that have been reintroduced, as well as giant tortoises and fruit bats. After arriving back to the mainland we will make our way to the small fishing town of Mahebourg. Once the capital of Mauritius, charming Mahebourg is a mix of bright Indian scarfs being sold on the stalls, Chinese street food in the market and a traditional English ice cream van on the harbour; harking back to an era of new arrivals from many different countries and cultures. Explore the market place, waterfront and the town's church before choosing a local spot for lunch and having some free time to leisurely wander around. This afternoon we'll return to our hotel with time for a swim or take a walk up the white sandy beaches. Alternatively, there will be the option to join a snorkelling trip in Blue Bay Marine Park. Just a 10 minute stroll along the beach takes us round to the tiny Blue Bay public beach where several glass-bottom boats can be found bobbing on the waves ready to run snorkelling trips into the marine conservation area. With more than 50 species of coral and a wide variety of fish, the area offers crystal clear snorkelling for those wishing to jump in! This morning, we'll make an earlier start to begin our guided tour of the southern part of the island. Our first stop will be to the panoramic viewpoint atop Trou Aux Cerfs, a dormant volcano. With a clearly visible crater in the centre, and 360 degree views across Curepipe town below, this is the only volcano in Mauritius that is not yet dead but has remained dormant for more than 100,000 years. After viewing Curepipe from above, we'll make our way into the bustling town with included visits to the town hall and Carnegie Library. The library here is of particular historic importance because it remains home to original Code Noir, a decree put together by France's King, Louise XIV, as a legal framework regarding slavery in the French colony. We then visit the sacred lake of Grand Bassin. This holy site, dedicated to Lord Shiva, is very important for the island's Hindu community, who believe the lake's water comes from the Ganges in India and is also the end point for many pilgrims. A 33 metre tall statue of Lord Shiva looms over the lake and is a busy hangout for the resident monkeys. We enter the tropical forest of Plaine Champagne, stopping at viewpoints overlooking the spectacular Black River Gorges National Park. Our lunch stop is in the Rastafarian village of Chamarel, where will also visit the amazing site of the Seven Coloured Earth. This natural phenomenon is a landscape of layered, volcanic earth ranging in hues from purples, pinks and reds. After stopping at the 83m high Chamarel waterfalls set within lush vegetation of the Black River Gorges we will make our way back to Blue Bay. After breakfast today there will the option to spend the day relaxing in the guesthouse gardens or on the beach, or take an optional excursion to one of the world's best botanical gardens and visit the sugar cane museum before an evening flight home. Originally a vegetable garden supplying food to passing ships, the Sir Seewoosagur Ramgoolam Botanical Garden is now most famous for the pond covered with giant, Amazonian water lilies measuring over 3 metres in diameter. The garden also features numerous trees which have been planted by famous visitors including presidents, members of the British Royal family and senior politicians from around the world. After visiting the gardens, we'll move on to an old sugar factory that has been turned into an interactive sugar museum created to explain Mauritius' strong links with the industry and its colonial heritage. This museum takes you through history, explaining the roles of the French and British, the infamous slave industry and the consequential arrival of thousands of Indian contract workers, as well as providing information of the different sugars produced and the growth of technology in the industry. This evening the trip will end with transfers to the airport. Mauritius experiences a mild tropical climate throughout the year. Being in the southern hemisphere its summer months are from November to April with an average temperature of 24-25 degrees Celsius, and can be humid with abundant rainfall. While its winter months are between May to October with an average temperature of 20-21 degrees Celsius, night temperatures can also drop to an average 16-17 degrees Celsius, making this the best period to visit the island. Hinduism, Christianity, Islam and Buddhism. All above optionals need to be prebooked and our local agent will assist with these arrangements. Please note that these activities do not form part of our contracted tour services. Clothing should be lightweight and ideally cotton all year round. Shorts and T-shirts are acceptable everywhere, although take long trouserskirts for evening wear. Don't forget your swimming costume. For Reunion please have a light cardigan or jacket for the evenings. Lightweight walking bootshoes or trainers are useful for exploring the islands. Sandals for relaxing and beachwear. Rubber soled footwear for beach walks. One main bag - either a holdall, soft bag or suitcase, plus a daypack. Take a small torch, water bottle, sunglasses, sunhat, suncream, insect repellent, binoculars if planning to birdwatch and a beach towel. Bring a lightweight rainjacket just in case. On Reunion some of the roads are very windy so if you suffer from travel sickness you may wish to bring your usual remedy. ATMs are available at the international airport, at banks in the main cities and at shopping centres. Credit Cards are accepted at some restaurants and hotels in main tourist cities and areas. On Reunion we are mainly staying at small guesthouses in picturesque towns. Our hotels in Mauritius are all located close to the beach, and are generally 3 star, most including swimming pools and restaurants. Reunion: Visas are not required by UK, Australian, New Zealand, US and Canadian citizens. Other nationalities should consult their local embassy or consular office. Mauritius: Visas are not required by UK, Australian, New Zealand, US and Canadian citizens. Other nationalities should consult their local embassy or consular office. All visitors should ensure their passport is machine readable. If you are travelling via South Africa (including transits): From 1st June 2015 South Africa will enforce new immigration regulations effecting all children aged under 18 years that are travelling to, from or via the country. The new laws state that parents and/or guardian maybe requested by the airline and/or South Africa immigration officers to provide additional documentation for each child they are travelling with. Please refer to the South African House website for full requirements: http:/outhafricahouseuk.com/visas/vis_forcit.html and your airline for up to date requirements. In order to check in for your flights you must carry full details of your flight itinerary - including all sectors. You will not be able to check in for your flight from Mauritius to Reunion without this. During the trip you will make a short visit to the Carnegie Library in Curepipe. This library is very important to the community and is a source of English novels and childrens books. Many of the books are very out of date and donations of new books are thoroughly appreciated. Even books with damage can still be appreciated as the library has a re-binding machine to make sure everything lasts as long as possible. If you wish to bring books with you your Explore Leader will ensure you can donate them to the library on your trip. Nothing compulsory, but we recommend protection against tetanus, typhoid, and hepatitis A . Consult your travel clinic for latest advice . Please note that you will be required to supply a yellow fever certificate if you have travelled from or via a country where yellow fever is endemic or risk of transmission. We strongly recommend the wearing long sleeved shirts and the liberal application of insect repellent as a precautionary measure to avoid being bitten. The above is not an exhaustive list. Further information regarding vaccinations and travel health advice can be found by following the NHS and NaTHNaC links at http://www.explore.co.uk/Travelhealth/ and from your local healthcare provider. Visa and vaccination requirements are subject to change and should be confirmed before departure. This trip is perfect for travellers that want to combine interesting culture, beautiful scenery and a lot of relaxing time on the beach. You will come home feeling relaxed, but with the sense that you have had a real adventure discovering two fascinating islands.